Like a huggable get-well card, these plush pals give topics from sickness to surgery a soft touch. Here's looking at you, kidney. It takes a lot of guts to share what you've got going on inside, but these plush pals give tough topics—from sickness to surgery—a soft touch. Wendy Bryan, an anatomically obsessed illustrator who loves internal organs and all their functions, organ-ized this charming line of stuffed guts that are designed to keep things light. 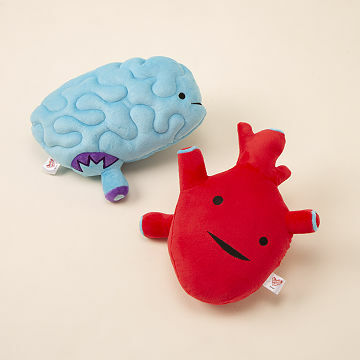 While each organ makes a great substitution for a get-well card, these adorable innards are also the perfect pals for pediatricians, psychologists, and surgeons to prop in their offices or waiting rooms to help ease the tension for patients of all ages. In your home, each personality-packed toy can also give even the littlest pre-pre-med student a jump-start. No matter how you use them, these squishy anatomical specimens will leave you in stitches. Designed in California. Made in China. This is a gift for a baby of 2 doctors. Not sure if it is really small enough for a newborn, but the idea is cute. Best nursing school gift, no butts about it. My nursing school friend was very pleased that it was completely anatomically correct! Sent plush colon to my nephew who needed emergency appendectomy. He loved it. Although it is likely these items are directed toward a young audience, I saw these plush organs and could not resist purchasing them for myself! It was so wonderful to see typically "taboo" organs (particularly reproductive and digestive systems) portrayed as the natural and beautiful parts of human anatomy that need to be discussed with the same acceptance as other organs (heart, lung, brain, etc.). My hope is that younger audiences can use these to assist in better understanding of human bodily function. I would buy this product again. Easily. I use it when watching movies or even as a neck cushion, the size suits it. It's well made and arrived in a timely fashion. But, most importantly, it's hilarious! My friend is a nurse and she will get a huge kick out of when she opens the box and I tell her that now she will always have her uterus. I recommend this product to anyone who will listen to me! My wife loves to keep it by her side while we watch TV. She thinks it is super cute, and even named it "Gilly the Gallbladder". She took it with her to our family Christmas get together and showed it off to everyone. I'm really happy I found this product and company to help cheer my wife after an emotional/stressful time leading up to her surgery. Thank you!!! This gift was great because it was comedic and meaningful. My boyfriend laughed for a solid 3 minutes when he saw it because we always joke about his missing gallbladder. Soft and cute. My friend loves it!